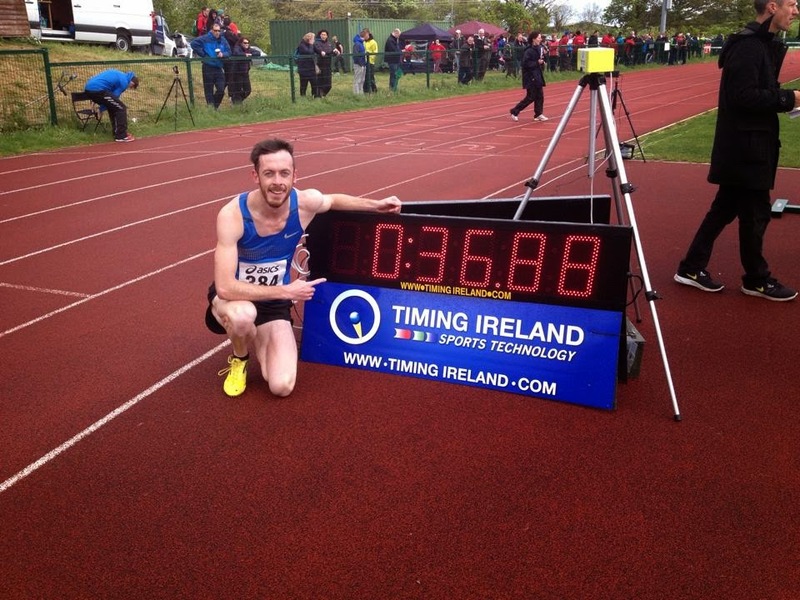 James Sullivan has been talking to one of Ireland’s leading 400m hurdlers, Paul Byrne. Paul Byrne is an elite-level hurdler from Co. Laois, Ireland, who specialises in the 400m hurdles. He represented Ireland at the 2011 European Under-23 Championships in Ostrava, reaching the semi-finals. He holds the Irish Best for the 300m hurdles with a clocking of 36.88. At the 2014 Irish National Championships, he claimed the silver medal in the 400m hurdles. His PB of 51.29 ranks him 8th on the Irish all-time list. Paul: Hi James, thanks for having me on the Running Review. I first got involved in athletics at about the age of six, though community games, like how a lot of Ireland’s athletes started. Both my older brothers and older sister paved the way for me to take up the sport as they were mad about it and had good success at a younger age. All of that and growing up just a mile away from my local running club, St. Abban’s AC, lead to me falling in love with the sport. Paul: When I started athletics I pretty much tried all the events I could. This was the philosophy of my club and of the coaches there; try them all and see which ones you were strongest at. Like most youngsters I started off running cross country (which I HATED!!) and from this I knew I was never going to be a long distance man. I knew where my strengths lay; jumps and hurdles. I had a fair bit of success underage at the high jump and short hurdles, receiving my first international vest at the Celtic Games in the 110m hurdles and winning All Ireland Schools’ titles in both high jump and 110m hurdles. I had dabbled with the 400m hurdles as my brother was going well over the sticks at the time. I suppose I wanted to emulate him without even realising it. I picked up the odd medal here and there at it, but still was completely raw and new to the event, and to be honest I found it hard going! I never really focused on the 400m hurdles until I was in first year in college, and even then it was a half hearted attempt. I ran 60 seconds for 400m hurdles at the intervarsities in 2008 I’m ashamed to admit, but I finished up that season with a PB in the low 55’s. That’s when I realised that I might have a bit of potential. Coincidentally in that last race of the 2008 year, in the National League Final, I came second to Jeremy Lyons, who little did I know was to become my coach for the following five years. Paul: I think the 400m hurdles definitely earns its title as the “man killer” event because of the massive stress and strain it puts on the body both physically and mentally. Like you said, it’s a very specific combination of all three qualities; speed, endurance and technique, that you won’t find with any other event. You can have all the speed and speed endurance in the world but without the proper technique you’re not going to be a good 400m hurdler. The great Edwin Moses once said about the event “very few 400m runners actually become 400m hurdlers because they can’t operate over the barriers when they run out of gas. So if you don’t like running in pain, you won’t be a 400m hurdler”. Thankfully the technique end of things is probably my strongest asset. I put that down to the coaches I worked under at a young age in St. Abban’s, who drilled us all in perfect technique on both legs before every session. I consider myself lucky in that aspect as the technique can take a lot longer to master than the speed and endurance elements. Having said that I see the speed element of my event as probably my biggest weakness. However, year on year I can see it improving and none better than last year with big PB’s over 200m indoor and out, and taking a silver medal at national indoors over 60m hurdles. James: You represented Ireland at the 2011 European Under-23 Championships in Ostrava, reaching the semi-finals. Can you put that experience into words? Paul: It’s without doubt the highlight of my athletics career to date. From picking up my bag of Irish kit, to meeting the rest of the team, I loved every minute of it. I remember pinning on my name bib onto my Irish vest the night before the first round and being so nervous. I don’t know quite how I managed to get to sleep that night but thankfully I got my few hours in. I think before the first round I was probably the most nervous I was before any race, even still. It was all pretty much a blur; I even managed to muster up a wink and a smile as the camera came past my lane for my friends and family watching at home. I must have been trying to give off an air of confidence even though my heart rate must have been sky high. As the gun went all nerves went with it. Although I was drawn in lane 2 and had everyone else outside me I tried to focus on my own race as much as possible. I remember repeating the words of advice my coach gave me via text message the morning of the race “your hurdles, your lane, your race”. I ended up finishing third in the heat and running within .10 of my PB. More importantly I had one of those all-important big Q’s beside my name on the scoreboard. The next morning I was much more relaxed, knowing what to expect with regards the warm up track, call room etc. that had been all so new to me the day before. I stepped out onto the track, into lane 1 and when the gun went I just gave it my all. I ran .02 slower than the previous day and finished seventh. I had been ranked in the lower section heading into the championships and I finished in 14th overall. Not exactly the gold medal draped around my neck, but nonetheless I was over the moon. Those are the days that every athlete lives for. I just hope I can get a taste of it again sooner rather than later. Paul: Setting a National Best this year over 300m hurdles (36.88) has to be up there. It is very seldom run but it was something different and a good way to start the season. It gave me a much needed confidence boost after a couple of years of a lull in the sport. Winning national senior medals both indoor (60mH) and outdoors (400mH) in 2014 I am also particularly proud of. Being part of ‘that race’ at the Morton Games this year is also a highlight. The crowd were amazing and Tom winning really pushed us all on. I also happened to break my PB in that race which was a long time coming after 3 years. James: After several years training in Dublin, you have recently made the move to Limerick to train with Irish record holder, Thomas Barr. What were your reasons for the change? How are you settling into the new setup? In what ways does it differ to your previous training routine? Paul: I suppose after the season had finished this year I sat down and had a long hard look at myself and asked whether I really wanted to continue with the sport. I enjoyed my break and when I came back the hunger was still there. After a lot of chatting with Jeremy (my old coach), who had brought me so far from a 55 second hurdler to where I was, I decided that I had unfinished business with the event. I even toyed with moving to 800m having run 1.53.9 after Nationals. I felt like I needed a change to my training and mix things up. What better way to mix things up than to train with one of the top European ranked 400m hurdlers and 48-second man, Thomas Barr. It was a no-brainer really and I told myself that to progress from where I was, I needed to train with someone who was faster than me. So far I feel I’ve been settling into the new setup very well. The UL facilities and setup are probably the best in Ireland in my opinion and the change of scenery down here is brilliant. It took me a couple of weeks to adjust as the training is quite different from what I was used to but I love it so far. The big differences I suppose would be: 1) the volume of training. Most weeks we have 10 sessions per week and we train twice a day most days. 2) The technical sessions. As Drew and Hayley (Harrison) both work from the UL campus they can come watch and supervise all our sessions. I feel this has really helped my running form and hurdling technique even at this early stage. James: What are your goals for 2015? Do you plan on competing indoors? Paul: Goals for 2015 would be to PB and really break into that 50-second mark. World University Games is also in the pipelines depending on how my applications for Masters courses turn out. Really, I suppose the ultimate goal is to reach my true potential and give this year a good shot. After that I can have no regrets however the season goes. I plan on having a lash at the indoor 400m hurdles at some stage this winter. It would be nice to be the first Irishman to do the event and get another national best beside my name. A nice shiny gold medal from Nationals wouldn’t go astray but I’m sure Tom (Barr) will have something to say about that :-)! Paul: As I’m so new to the group down here I’m not fully sure what will be on the cards come outdoors, but previously I would have done fast reps of 300’s, 250’s or even 150’s coming into the outdoor season, off long recoveries. These sessions would be done over a mix of hurdles and on the flat depending on how close to a race etc. Paul: At the minute every second week we have a big technical hurdles session. This would include drills, rhythm work, sighting the hurdles and working on hurdling off both legs efficiently and fast! An example would be hurdles at random spacing’s so you have to be very switched on. It’s just as tough mentally as it is physically as you have to sight the hurdle without stuttering, hurdle well and then prepare for the next hurdle all at once. Paul: Currently as it’s still quite early we haven’t incorporated any hurdles into the longer reps, but I know from previous training that this isn’t too far away now. 500’s and 600’s, which are often ‘split’ runs, are the more aerobic type sessions we do. I think this is most 400m runners’ bread and butter sessions throughout the winter and they are the types of sessions I prefer most! I also have 2 x 20 minute runs per week to keep the lungs ticking over. Paul: As mentioned above, any long reps or more aerobic sessions are probably my best type of sessions. I wouldn’t go as far as saying they’re my ‘favourite’ but they are definitely some of my stronger sessions. Hurdle sessions during the middle of summer are my favourite. Maybe two runs to hurdle 8 (300m) with long recoveries in-between. If you hit that right you know you are in top shape. I also really enjoy the sessions where you have lactic coming out of your eyeballs. You know you have left it all on the track after those. I think I speak for most of the hurdlers in the group, but my favourite sessions are the ones just where we are hurdling! It takes the monotony out of running on the flat and takes your mind off the pain. I don’t know how those 400 flat guys do it at all!! Paul: I have been pretty lucky with injuries throughout my entire running career. I seem to have a habit of picking up annoying little injuries though. Before national seniors 2013 I completely did my ankle throwing an American football of all things. I also had some lower back issues throughout the 2012 season. The biggest period of training I’ve has to miss due to an injury was during my 2011 season where I picked up a tiny tear in the medial side of my meniscus in my right knee. I was out for over 6 weeks and when I came back, any kind of short speed work seemed to aggravate it. During those 6 weeks off I did 2 or 3 bike sessions per week, as it was all I could do. That was the make or break for the season as completing those horrific sessions on the bike and doing my rehab to strengthen my quads, glutes and hamstrings kept me in great shape and I managed to qualify for Euro Under-23’s that season. James: The financial demands of training full time in this sport are no secret. How do you fund yourself? Paul: Financing my athletics career has always been a challenge. I definitely couldn’t have made it this far without the constant support from my parents and I’ll be forever grateful to them for allowing me to follow my dreams in athletics. Currently I’m working part time and using my savings to cover the costs of training/physio/travel etc. I’m working with nTrai.com and I’d be delighted if there is a company reading this that would be interested in sponsoring. I know that as a company it’s vital to be getting commercial value from the sponsorship and together with nTrai we have a very strong proposal for a company to see a return. I’d be delighted to pitch the proposal and see if there is anyway that we could work together to create a win-win scenario. James: You are a proud member of St Abban’s AC, who have been punching above their weight of late, notching five medals at this year’s National Championships, the men finishing second in the Premier Division in the National League, and the women finishing first in Division One. What do you believe to be the reasons the club competes so strongly against the country’s bigger clubs? Paul: I think the reason we compete so well against the bigger clubs from Dublin and Cork is that we have an extremely good sense of club and what it means to pull on the green, white and gold singlet. Everyone in the club comes from about a 15 mile radius, which makes it truly unique in that we have an exceptional pool of home grown talent. With good athletes come good coaches and at the helm of St. Abbans are the Kelly Family (Pat, Michael, Eamon, Ger) who selflessly dedicate their lives to coaching the youth of our club. Although we are based in a small parish in the southeast corner of Co. Laois, we are blessed to have extremely good facilities. Again this is down to the tremendous sense of club and pride in the club through years of fundraising. A floodlit 400m cinder track, gym, cross country loop and sports hall all contribute to our success on a national level. James: The depth of quality coming through in Ireland in the men’s 400m Hurdles is particularly strong. How significant has the formation of the Irish Hurdlers Series been in raising the overall standard in the event? Paul: I think without the Irish Hurdlers series we wouldn’t have the strength and depth we have currently. I was lucky enough to be in the first ever Irish Hurdlers Race Series race down in CIT in April 2010. What unfolded that day surprised everyone and kick started us to where we are now. Patrick Maher ran a national junior record (52.1) that day with John Fagan not far behind (52.5). These times would have easily won nationals the year previous and it was still only mid April! People ran fast that day simply because there were numbers in the race (I think we had 7 lads there). In previous years you would struggle to get 3 or 4 guys to commit to a race over the 400m hurdles, but thanks to the race series guys were gunning to beat each other and turn up week after week to far flung meets like Sligo, Athlone and Castleisland in order to get points on the board. Constant interaction on Facebook also helped as the Irish Hurdlers would post witty headlines and updates about athletes/races. This ultimately got us to where we are today with 13 men sub 55 seconds in 2014 and more to come in 2015. James: While the standard at the top end is very high in the hurdle events in Ireland, there is a noticeable lack of participants at senior level when compared to the flat events. None of the four hurdle events required heats at this year’s National Championships, and hurdle races are rarely on the Dublin Graded Meet programme. Why do you believe numbers are lower in these disciplines, and what can be done to raise participation levels among senior athletes? Paul: Numbers are low (especially in the women’s events) simply due to a lack of coaches with the knowledge to coach the 400m hurdles. There are maybe three or four strongholds where most of the 400m hurdlers seem to some from in recent years (Dublin, Limerick, Belfast, Cork). More hurdles and specifically 400m Hurdles workshops could be done nationally to increase the popularity and interest. Personally I would love to see heats in both men’s and women’s events at nationals 2015 as we definitely have the strength and depth. I think we will see an increase in participants with the likes of my training partner Thomas Barr making the event more glamorous and to the fore in coming seasons. Much like the renaissance of 400m running after David Gillick started winning medals. Paul: Having travelled to many European countries for races, it never ceases to amaze me the crowd even the smallest of midweek meets seem to draw. I just don’t think this will ever be the case in Ireland because we are competing against too many other sports. However I think we need to take a leaf out of their book and do the simplest of things like play loud music, introduce the athletes to the crowd, give athletes bib numbers with their names on so that the crowd can get behind each athlete instead of just a number, and generally publicise and hype our top athletes more. Ireland could learn from the ‘American Track League’, which started Stateside this year. This saw meets coming to some of the smaller towns in America but with massive names like Lolo Jones and Ashton Eaton competing. Ireland could make its own ‘mini series’ with meets like Cork City Sports, Morton Games, Belfast International and Letterkenny International getting on board. Paul: I would love to see more emphasis put into our throws and field events as it seems every time at European Team Championships this is where we falter somewhat. Employment of full time coaches in sprints, jumps and throws is a necessity I believe if we are to catch up with our European counterparts. James: That’s great Paul. Thank you for your time and the very best of luck for 2015. Paul: Thanks a million for having me! Happy Xmas and here’s to plenty of PB’s in 2015.